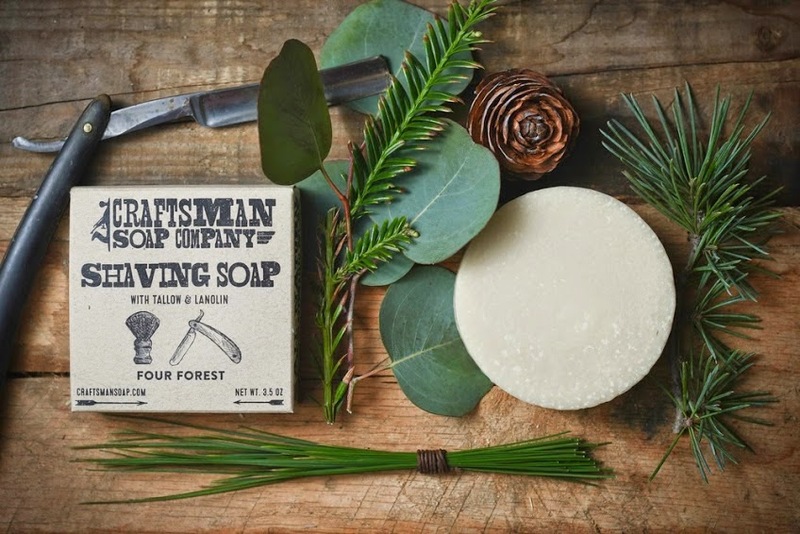 Craftsman Soap Company has a wonderful website they offer hand soap, beard wax and balms. When it comes to shaving soaps they have just one offering called Four Forest. When the package arrived it was this little box almost the same size as the hard puck along with two cards one for a 10% discount on my next order and the other thanking me for my purchase and if I had a question or feedback they would be glad to hear from me. The puck is boxed in a square cardboard pocket slightly bigger then the puck. With the logo on the front and instructions on the back explaining that the soap is to be lathered using a brush and gives instruction on how its done. When looking at the type on the package I think of the old time Sears and Roebuck catalogs it suggests that the brand might have been around from that time period. Craftsman describes its scent as a combination of collected scents from forests around the world. The top notes are Cedar, Eucalyptus, Pine and ending with Hemlock Spruce. The sent from the puck is strong even before I open the shipping box I could smell the puck. The scent strength is about a 5 out of the box and 6 during a lather. Since this was a hard puck I used my scuttle and bloomed the puck for about 10min. Loading the brush was no problem and creating lather took a little bit more effort than expected. The scent started to get a little stronger now as I applied the brush and worked a face lather coating my beard. It was a good lather and held up fine and provided good slickness and glide during the entire shave.